Nearest: Tube Station: Lancaster Gate 0.3 miles (0.4 km), Railway Station: London Paddington 0.4 miles (0.6 km), Motorway: M4 Junction 1 4.5 miles (7.2 km). There are 4 tube (underground) stations within half a mile (0.8 km). The Commodore Hotel London is situated close to Hyde Park in a small section of Bayswater known as Lancaster gate. Perhaps bet known as the area where the football association has its headquarters. 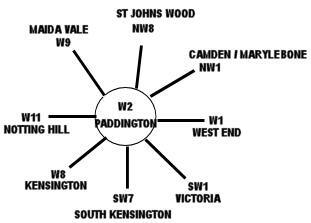 Less than half a mile away is the Paddington train station which has a direct service to Heathrow Airport called the Heathrow Express and a slower service called the TFL Rail service. Nearest major shopping can be found at Queensway (0.3 miles) and the Whitley's centre with Notting Hill (0.7 miles) and Kensington High Street (0.9 miles) just beyond that. Less than a mile in the opposite direction finds Marble Arch which is home to Speakers Corner and marks the start of both Edgware Road and Oxford Street, 2 very busy shopping areas. Hyde Park is just 150 yards south of the hotel and offers large open spaces with many activities such as horse riding and boating. Lancaster Gate itself is relatively quiet with no major traffic flows unlike the nearby A40 Bayswater Road which is main arterial route into and out of London. Although classed as a central London area its actually some 2 miles from the most central areas around Piccadilly Circus. However many visitors choose this area for its good transport links and slightly lower rates than the most central districts. The Commodore Hotel is a Townhouse hotel dating back to 1860 where traditional Victorian elegance is blended with contemporary interior designs to create an elegant and comfortable ambience in all of the hotel's guest rooms and public areas. All rooms en-suite (toiletries supplied) and air-conditioned. They have a mini-bar, tea/coffee facilities, Satellite TV, telephone, radio, digital safe, hairdryer and high speed broadband internet. The hotel also has Victorian-style Suites with 4-poster beds that are furnished with beautiful antiques. The Executive Suite Rooms have a more modern style with contemporary furnishings and a chic feel. Some of the executive rooms have a 3.5 metre high ceiling whuch has been restored to its original look. Tall sash windows overlook the square in front of the hotel. Rooms have either a king size bed or 4-poster bed. Bathrooms have Italian Carrera marble decor, some have American style walk in shower. The on-site Mediterranean Restaurant provides a mix of European & Mediterranean cuisine. The hotel has 'The Red Bar' with its traditional style, leather sofas and cosy feel serves a range of drinks and wines. The hotels heart is the lobby lounge area where you will exquisite Victorian antiques and where traditional afternoon tea is served. Hotel serves buffet and full English breakfast. The Fitness Studio with state of the art cardiovascular machines and free weights provides for the more energetic and health conscious guests. Complimentary 24 hours for hotel guests. 24 hour hotel reception. Compared to other London hotels: This hotel has been rated 60% by past guests. The London average is 80% and the average for 4 star hotels is 83%. Therefore this hotel is below average for its sector (star rating) . Milesfaster ranking: 824th from 866 London hotels, and 327th of 328 four star rated hotels. We can also point you towards a lower price option, the Doubletree By Hilton Tower Of London. 0 miles from the Commodore Hotel (0.0 km), achieving a rating of 89% by its past clients with base rates starting at about £119 (theres free WiFi too). The closest fifty one hotels around this area (50 Lancaster Gate, W2 postcode) that are listed on this website cover a 0.4 miles (0.7 km) radius. The numbers for each star rating are 1 five star hotel (rated 89%), 19 four star hotels (average rating 81%), 20 three star hotels (average rating 69%) and 10 two star hotels (average rating 67%). The highest rating in the isa goes to Royal Park Hotel (4 star) at 90%. Base Rates: We look at what the average base rates are for the area and by star rating. These rates do not take account of offers and short term deals so are just a guide. If we look at the average for all hotels in the area (nearest 51) we get an average base rate of £87 per night. The lowest rates are at £11 at Smart Hyde Park View Hostel (2 Star, 71%) and highest base rates of £720 at Commodore Hotel (this hotel) (4 Star, 60%). Averages for each sector of star rating: Five Star average: £269, Four Star average: £115, Three Star average: £73 and Two Star average: £45. In terms of value for money for the local area we rank Smart Hyde Park View Hostel top. comment: Totally refurbished in 2003. Part of the Grecian hotel group.